A video preview of the upcoming collaboration between KISS and Japanese idol pop band Momoiro Clover Z has surfaced. The pair have teamed up for the single, “Yume no Ukiyo ni Saitemina”, which will be released on January 28. Each group will issue their own versions of the tune. The KISS edition will present three newly recorded tracks including a lead track and each off vocal version in a package totalling six tunes. 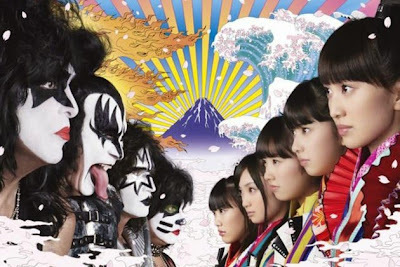 The Momoiro Clover Z edition will feature two newly recorded tracks including a lead track and each off vocal version, plus a music video of the lead track. The pop band will open for KISS on March 3 at the Tokyo Dome, the final show of the band’s 5-date Japanese tour.